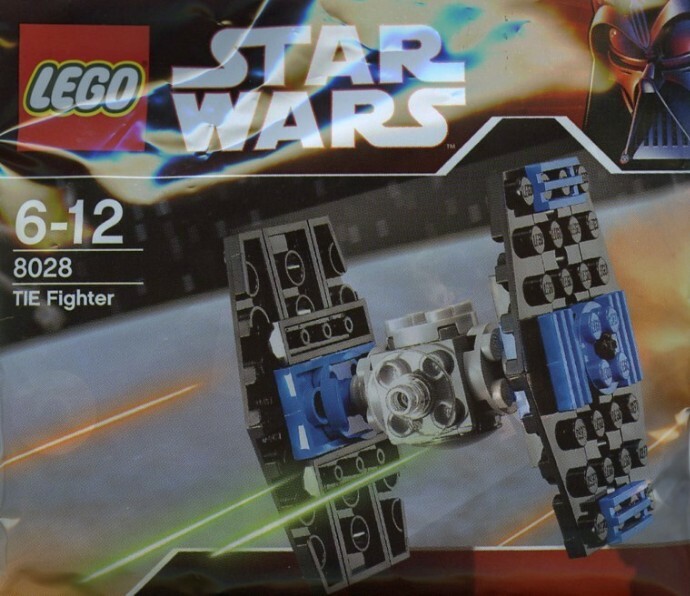 Today's random set is 8028 TIE Fighter, released in 2008. It's one of 21 Star Wars sets produced that year. It contains 44 pieces, and its retail price was US$4.99. It's owned by 6965 Brickset members. If you want to add it to your collection you might find it for sale at BrickLink or eBay. Ooh, another micro scale SW set, good stuff. Can't say I'm a fan of this one though, and it's all down to the cockpit. The windshield is too clear to be visually effective (a print may have helped, or even a darker tint to the plastic), and the top is lumpy (a solid grey version of the windshield construction might have helped here, I think). Of course, it's only a tie. It's not like they had one shot at making this ship and missed. It is shaped like a bow tie. Coincidence? I think not! Now how many do they really need to make of this design? 50,000 more cause they’re AWESOME. A TIE fighter is always a TIE fighter... Micro, UCS, regular minifig scale... Iconic! Hey, nice! Another one within the past week that I own! I think I have dis somewheres. Oh, hey, I own this one! I wonder how many micro TIEs there are. I have this one, but did not remember it was released so long ago. Years are going fast... Still displayed in front of the big one, old Tie version 9492. I still hesitate to grab the newer 75211 which looks like a good upgrade. Woah, am I seeing things correctly? A STAR WARS SET!!! Oh my goodness three in a row! I remember picking this up because anything LEGO Star Wars was still kind of a novelty and I was having the time of my life finding and buying my two favorite things mashed into a single thing! I believe this was the last blue TIE Fighter. I like both the blue and bluish-grey designs. The old TIEs had a pop of color but the new ones are more accurate. I've got loads of these - around 2012 I stumbled across a ton of them in Tesco, at 20p each!